Thailand has seen a large increase in migrant workers from Myanmar since the 1990s. A constant flow of migrants arrive to seek refuge from dire circumstances in their homeland and/or to seek better work opportunities. They have adapted to changing state policy regarding their migrant status and work permits as well as to more immediate means of control. Previous works on this subject have tended either toward macro-level policy and economics, or more journalistic accounts of individual migrant experiences. Little attention has been paid to differences in the migrant processes and networks formed across the border and within the country. 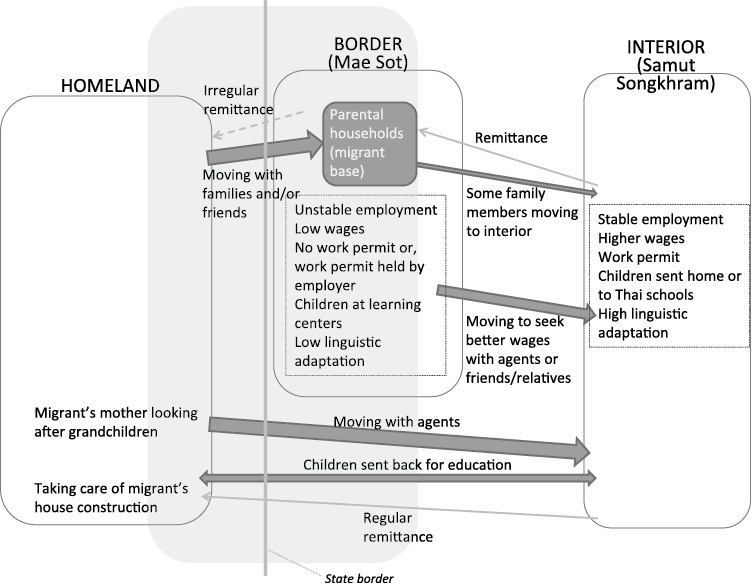 In this paper two locales, one on the border (Mae Sot) and one in the interior (Samut Songkhram), are compared based on interviews conducted with migrant workers on their mode of arrival, living and working conditions, migrant status and control, and how they form networks and relations within and across the border. By comparing the two locales, rather than emphasize how the state and geopolitical space define mobility we argue that transnational migrant workers formulate and define their space through adaptive networks in articulation with geopolitical factors as well as local socioeconomic and historical-cultural dynamics. The dynamics among macro policies, micro-level agency of migrants, and meso-level networks define each locale. There has been an increase in the number of migrants from Myanmar to Thailand since the late 1980s,1) spurred by Thailand’s rapid economic growth. 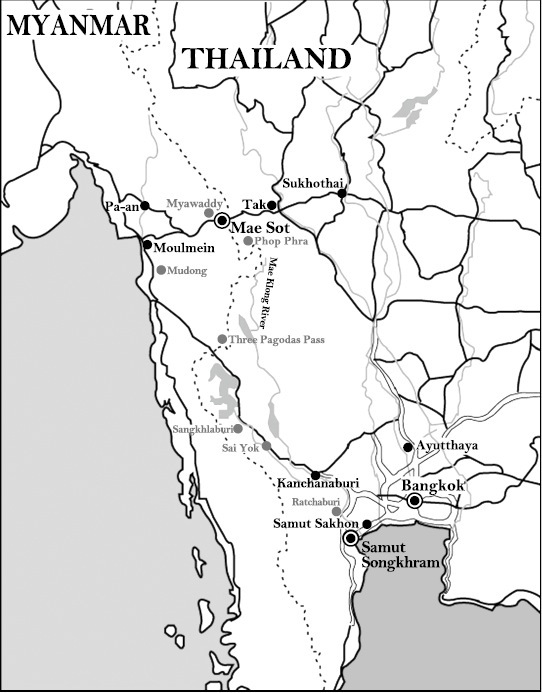 Interviews conducted in the lowland Karen State, in the township of Pa-an, reveal that in the late 1980s the direction of migration among labor from Myanmar switched from westward toward Yangon to eastward over the mountains into Thailand (Hayami 2011). Each household had at least one member working in Thailand—in construction, fishery, agriculture, or manufacturing, or as domestic help. Migrant labor from Myanmar (as well as Cambodia and Laos) filled jobs that Thai workers considered “dirty, dangerous, and difficult.” The border zone may be regarded as an “economic dam,” where cheap labor keeps flowing in while their way into the interior is blocked. However, migrant workers also make their way into interior prefectures where working conditions as well as social and cultural contexts differ markedly from the border. In this paper we study migrant laborers in two locales, one on the border (Mae Sot) and one in the interior (Samut Songkhram). By comparing the two locales, rather than unilaterally arguing on the manner in which state and geopolitical space define mobility, we suggest that transnational migrant workers formulate and define their space through adaptive networks in articulation with macro-level policies as well as local socioeconomic and historical-cultural dynamics. Studies on migration have been carried out in the social sciences for over half a century, either in terms of rural to urban domestic migration, or the migration of Europeans and Asians to North America. The recent increase in migration to destinations formerly deemed “sending” countries has spurred renewed interest in the subject. Vari­ous approaches from multiple disciplines, beginning with the economic push and pull theories or dual labor market theory, world systems theory, and historical-structural analyses, have been employed to understand the phenomenon. It has become increasingly clear that a far more integrated perspective, which both incorporates the role of the state and pays attention to human agency, is necessary in order to view the migration systems and networks from a historical, political, and economic perspective, examining both ends of the flow and their linkages. As a way of understanding migration, Caroline Brettell identified three levels of analysis (Brettell 2003, 2)—the macro, micro, and meso. The macro-level refers to the structural conditions that shape the migration flow and constitutes the political economy of the world market, interstate relationships of the countries involved, income differentials, the laws and practices of citizenship established by the state, larger ideological discourses, the demographic and ecological setting of population growth, availability of resources, and infrastructure. Transnational migration impacts the state policies of citizenship and sovereignty (Castles and Miller  2009), and states must regulate, control, and decide on how to deal with the influx and how to grant rights to immigrants. It is important to take note of changes in policies and regulations over time that control the entry and exit of migrants, which are affected by Thailand’s increasing demand for cheap labor. In this regard, a key issue regarding borders and citizenship among migrant workers in Thailand is the registering of illegal migrants with work permits, a system that became institutionalized after 1992 (see next section) and which Pitch Pongsawat (2007) refers to as “border partial citizenship.” The politico-economic order is constituted as an ongoing process between state exercise of power to control the border, exploitative capitalist development, and illegal immigrant workers’ response to the situation, allowing the continued employment of migrant workers with low wages. This system contributes to the maintenance of an exploitative process. While registered worker status ostensibly grants “amnesty” to work in Thailand, workers are subject to search and street-level harassment by the police as well as exploitation by their employers, and their mobility is severely restricted. In Pitch’s view, if “border” implies the ability of the state to demarcate the boundary, then the Thai state policy to extend the conferral of “amnesty” to provinces away from the border as a flexible way of procuring cheap and exploitable labor could be seen as a way of forming borders beyond the physical border. As the number of provinces where such amnesty was extended increased, the border expanded (ibid., 199). In this sense, the border extends into the lives of migrant workers in the interior parts of the country. Pitch’s poignant critique of state policies evaluates the manner in which macro-level policies affect micro-level responses. Despite his assertion of the “non-physical border” existing in the interior provinces, Pitch discusses only Mae Sot and Mae Sai, two border towns, and does not delve into the system as it operates in spaces other than the immediate physical border. This paper, on the other hand, looks at the practices and processes of migration both on the border and in the interior, to consider in what sense the latter is, or is not, merely an extension of the physical border. Micro-level analysis looks at the agency, desires, and expectations of individual migrants, and how larger forces shape their decisions and actions. In her work on Filipino migrant workers, Rhacel Salazar Parreñas (2001) points out that the transnational household must be seen as part of a larger extended family across borders. Transnational households are in many cases upheld by values of mutual help and support among extended family and depend on the resilience of such bonds. They also act as conduits of information and social networks and promote the continued flow of workers. This paper studies households as units of analysis, and reveals that these units are in fact part of a network that is dispersed across the border. Coping strategies are formulated within this network by utilizing opportunities in the different localities. Thus, micro-level analysis is inextricable from the meso-level. According to Brettell, the set of social and symbolic ties and the resources inherent in these relations constitute the meso-level. While individual migrants seek to improve their lives and secure survival and autonomy, the decision to migrate is made in the context of a network of cultural and social ties. The meso-level is the relational dimension manifest in social networks, linking the areas of origin and destination (Massey et al. 1998). The networks provide the social capital and information that enable individual choices and agency within the constraints of macro structures, thus linking the three levels. Social networks of migrants are contingent and emergent (Menjívar 2000, 36). Yet, migration studies have too often taken for granted “place” as given and static, from and to which people move. This reiterates the state’s perspective, where mobility is the anomaly and staying in one place is the norm. Toshio Iyotani suggests that the perspective might be reversed from understanding mobility between stable places, to understanding space from the point of view of mobility and migration (2007, 4). The focus of attention on network formation at the meso-level will allow us to look at space from a non-state perspective. In his criticism of how social science theories have been dominated by state-­centered frameworks, Willem van Schendel makes a similar point regarding border zones specifically, by focusing on the flow of people, goods, and information. In order to free ourselves of this state-dominated framework, he suggests that we look not only at state-defined maps, but at the cognitive maps of those involved in the borderlands in which “pre-­border” and “post-border” maps are juxtaposed with the state-defined map (Van Schendel 2005). The pre-border map constitutes the network of relationships that preexisted and cuts across the state border, recognizing the social and cultural continuities inherent in it. These relationships, in the form of kinship and trade networks along with cultural and religious communities, not only persist despite state borders, but may provide security in the face of the division brought about by state-based maps. These pre-border relationships may enable adaptations to constraints brought by the state-defined borders by the creation of “post-border” maps. One attempt to look closely at these post-border maps is Lee Sang Kook’s study of migrant workers in Mae Sot (2007), which refers to the “border social system,” challenging prevailing notions of the sovereignty and social order of the state. Lee points out how informal institutions that are unique to the border constitute the political/economic space of the border. The layered maps, from the perspective of the people who live on the border, allow us to look at the border not as a given static place, but as a space defined by an articulation between the state border, migrant processes, and networks and relations across borders, old and new. When viewed from this standpoint, the maps overlap. Rather than take for granted state-defined maps and look merely at the flow between states, we will look at migrant spaces both on the border and in the interior from the point of view of the inhabitants of those spaces as well as those involved in the flow. 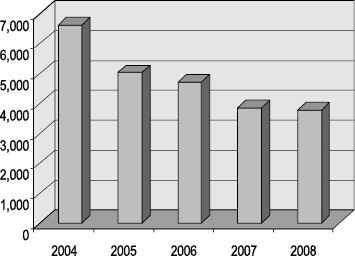 In Thailand, studies on migrant labor began with the recognition of the increase in their influx in the early 1990s. The studies can be categorized mainly into three types. The first are studies that look at the changing state policies on immigration and migrant labor in the long term (Kritaya et al. 1997; Phanthip 1997). Kritaya et al. pointed out at an early stage that Thai society did not prevent the assimilation of people from other countries; however, Thais accepted foreigners as one of their own only under certain conditions. Kritaya and Kulapa (2009) also studied the effects of the policy change in 2008 on the hiring process of workers from Cambodia, Myanmar, and Laos. The second category constitutes studies that look at the conditions and realities of migrant workers. 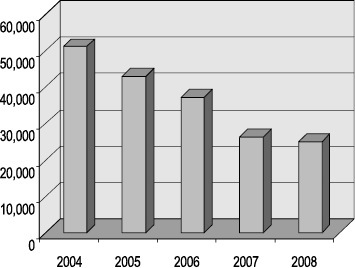 Some of these are statistical (Huguet and Sureeporn 2005; World Vision 2005), whereas others are more qualitative and descriptive of specific populations or issues, such as Chalermsak Ngaemngarm on the illegal Karen population in Mae Sot (1992), Sukhon Khaekprayuun on female workers in Samut Sakhon (2003), and ­Bussayarat Kaanjondit on unskilled migrant workers in Bangkok (2006). Nwet Kay Khine (2007) as well as Aree Jampaklay and Sirinan Kittisuksathit (2009) study remittance ­patterns, and Zaw Aung discusses Burmese labor rights protection and movements in Mae Sot (2010). The third category are studies that analyze the factors that cause migration ­(Srinakhon 2000; Phassakorn 2004), mostly concentrating on the border situation at Mae Sot. Toshihiro Kudo focuses on Mae Sot, situated on the East-West Economic Corridor, and how industries have opted to stay on the Thai side of the border because of its infrastructure (availability of electricity, and roads that allow materials and products to be transported easily) and cheap labor (Kudo 2007). In an integrated approach, Supang Chantavanich studies the impact of transnational migration on the border community in Mae Sot, examining the economic, social, cultural, political/legal, and health impacts of the increasing labor migration (Supang 2008). Dennis Arnold also examines the political economy of Mae Sot, with an eye on local and state-level authorities and agencies that operate to maintain the Special Border Economic Zone, the legitimizing of cheap labor and labor conditions, and how workers have coped in the face of this (Arnold and Hewison 2005; Arnold 2007). The lens through which migrant workers in Thailand have been viewed thus far has been focused either on the border areas or on the perception that migrant workers are one marginalized category vis-à-vis state regulations. In social science discussions since the early years of the twenty-first century, there has been an emphasis on transnational space created by migrant networks (Faist 2000; Brettell 2003; Castles and Miller  2009). This has not been fully addressed in studies in Thailand, or in mainland Southeast Asia in general.2) In Southeast Asia, transnational networks are created literally across borders. The physical border itself is a political, sociocultural, and historical issue. This paper will reveal that the problems that migrant workers face, and the adaptations they experience, are not necessarily the same on the border as in the interior. It is the dynamics between migrant mobility patterns, their adaptive strategies, and the local historical development of sociocultural, economic, and political factors that shape multilayered space not only across the border but also within the same state-defined space. After a brief overview of state regulations, especially those in Thailand, and an introduction to the two study locales—one on the border and the other in the interior—the main part of this paper will be based on interviews conducted in the two locales regarding the mode of arrival of migrants to Thailand, work conditions, migrant status, social networks and family formation, and cultural adaptation. Laws governing the movement of people across borders were instituted in Thailand in 1950. Continuous changes and additions have been made since then with regard to laws and policies that control people’s movements.4) The Immigration Act 1979, amended from 1950, is still primarily in effect (subsequent revisions pertained to details such as the immigration fee). The Alien Occupation Act, which aimed to control alien workers and reserve job opportunities for Thai citizens, was launched during the revolutionary council in 1972.5) In 1973, the law restricted aliens and foreign workers to 39 types of jobs. Up to 1978, the major concern in Thailand was national security and stability. The Thai government took up a policy of “constructive engagement” with Myanmar that began during General Chatichai Choonhavan’s administration (1988–91). Thai workers who were involved in the industrial and agricultural sectors began shifting to higher-paying work in the city, creating a demand for cheap labor. As the cost of labor increased during Thailand’s boom decade (1986–96), particularly in 1991 and later when real wages grew 8 percent a year, an increasing number of Myanmar workers migrated to Thailand to take up low-wage jobs. Jobs in fishery and seafood processing, plantations and agriculture, domestic work, and factories were often shunned by local Thais, and consequently the Thai economy became increasingly reliant on cheap migrant labor. In 1992, Thailand took its first steps toward the adoption of an immigration policy for unskilled foreign workers by issuing short-term work permits in nine prefectures bordering Myanmar. Immigration law declared all migrant labor illegal, but workers were given permission to work by registering annually. Many anomalies cropped up as a consequence of this. First, in this system, workers were registered by a single employer and were not permitted to change employers unless they were re-registered by paying another full fee. Second, registration took place only twice a year, which rendered illegal those workers who entered the workforce in the interim period between the two registrations. Third, employers generally paid for the work permits of migrant laborers and deducted the amount from their wages in monthly installments. However, most small businesses and farms could not afford to pay the fees, and thus a large number of workers remained unregistered. Under such circumstances, both employee and employer were potentially vulnerable to harassment and extortion by the authorities. Fourth, those employers who did pay for the permits often held on to the original copy to maintain control of the workers for fear of losing them before the fee was repaid. This meant that workers were often unable to access health care and were subject to deportation because photocopies of documents were not recognized by the authorities. Fifth, not all incoming workers were aware of the registration procedure. Hence, migrant workers were faced with the constant threat of deportation with or without work permits, extortion by police and officials, heavy debts to the agents who negotiated their jobs leading to bonded labor, restriction of freedom of movement, and lack of health care. Their inability to speak Thai as well as their lack of information and awareness of labor and human rights added to their plight. Subsequently, the laws aimed at controlling alien workers were revised with a gradual emphasis on human rights. This involved the opening up of previously restricted work areas, and the granting of employee rights and options to migrant workers.6) In 1996, the Thai government launched a regulation under the Ministry of Labor and Social Welfare that allowed foreign labor to enter the country legally, and to work under provincial restrictions and requirements. A significant number of migrant workers from Cambodia, Laos, and Myanmar were registered with the Department of Employment. They could now work in 39 (later 43) provinces in 7 (later 11) industries. This is what Pitch (2007) refers to as the extension of the border beyond the physical border. In 1998 the Labor Protection Law was enacted, and immigrant workers came under the control of labor welfare and the labor court so they could directly sue on issues related to labor protection. In 2001 a new labor registration was instituted under Prime Minister Thaksin ­Shinawatra, when 560,000 laborers were registered in two months. Of this number, 40,000 were in Mae Sot. The annual cost of registration per worker was 4,500 baht, and it conferred on each worker the right to the 30 baht medical system. However, from the perspective of the workers, the economic and social costs of registration surpassed its merits. In 2003, an MOU was signed to allow workers from Cambodia, Laos, and Myanmar to register in Thailand, yet it took a long time to negotiate the details between Myanmar and Thailand. The Myanmar government recognized the importance of foreign exchange remittances. It had implemented overseas employment since 1999, and official employment agencies had sprung up, sending workers to other countries in Southeast Asia as well as to the Middle East. The Myanmar government attempted to control remittance flows by sanctioning remittances through government banks and taking a 10 percent service fee on the transactions. Meanwhile, the black market for international transfers flourished. In 2005, Myanmar also strengthened its efforts to institutionalize migrant workers in other countries (Malaysia, Singapore, the Middle East, Korea, and Japan), and immigration offices were set up at three major points along the Thai-Myanmar border: Myawaddy (opposite Mae Sot), Tachileik (opposite Mae Sai), and Kaukthaung (opposite Ranong). In the same year, the Thai government executed a royal decree7) allowing illegal aliens to work without a restriction on their numbers. The five districts along the border in Tak Province (Mae Sot, Phop Phra, Tha Song Yang, Mae Ramat, and Umphang) cover about 300 kilometers of border with forested hills and rivers. Historically, the area was a strategic point in the war and trade route from Mon country in Burma to Siam. Tak (Raheng) was the outpost of the Sukhothai principality. Prior to the imposition of the modern border, the area was a vibrant economic frontier since Britain started to explore the wealth of the region, especially the teak forests, as well as trade routes connecting its colonies to larger markets in China. When Thai King Rama III opened commercial dialogue with British Burma and conducted a survey of the area, the governor of Raheng pointed out 11 caravan routes cutting through the hills beside the Moei River and terminating at Moulmein. New forms of communication were implemented or proposed along this route, such as a postal service and a telegraph line. Mae Sot was unclaimed prior to the demarcation of the border. Officers from Siam and Burma sometimes passed by to demand tribute from local Karen. This became the first area where the modern border agreement between British Burma and Siam was established in 1868. What had been forest settlements inhabited by Karen were promoted to a modern administrative town in 1898, bringing a gradual influx of the northern Thai population. Logging and border trade became key activities, and the market, which was frequented by Yunnanese Chinese Haw caravans, used British Indian currency. The city municipality of Mae Sot was founded in 1937. It is because of these historical and ethnic connections that to this day there are formal and informal networks of Karen, especially networks based on religious activities such as through the church or the Buddhist temple, and some based on political factions as well. The town began to prosper in the 1970s, as it became the center of the black market border trade by the Karen National Union. Until the 1980s, the union controlled all routes and trade connecting Mae Sot to Yangon. On the Thai side, counterinsurgency brought about the development of infrastructure, and the road from Bangkok to Tak was completed in 1970. Whereas economic activities in Mae Sot had previously depended more on the Burmese town of Myawaddy, the political situation in Burma caused the center of urban development to shift to the Thai side. In 1988, the movement for democracy in Burma sent students to the border. After Thai Prime Minister Chatichai’s declaration of “constructive engagement” the same year, factories began to spring up in Mae Sot and an increasing number of Burmese workers migrated across to take up low-wage jobs. In 1993 three provinces, including Tak, were designated as special investment promotion zones. Factory construction along the ­border was encouraged, with tax and duty privileges offered. After the 1995 fall of Manerplaw, the headquarters of the Karen National Union on the Myanmar side, the Thai government enhanced economic activities along the border. The Burmese regime controlled Myawaddy, under the influence of the Democratic Karen Buddhist Army, the Karen faction that was aligned with the regime.11) This was the turning point in Mae Sot’s character and industrialization. In 1995, industrial investors arrived to employ the large pool of illegal migrant workers. The Thai-Myanmar Friendship Bridge was completed in 1997, and Burmese citizens gained the right to cross the bridge to Mae Sot without passports for a one-day stay.12) It was also in the late 1990s that former student activists from Myanmar began to get involved in migrant labor issues. A migrant workers’ rights group called the Yaung Chi Oo Workers Association was formed in 1999. In the 1990s Mae Sot was included in the Thailand Board of Investment’s zone 3, which includes zones in the peripheries with tax privileges. It is also strategically located on the East-West Economic Corridor of the Greater Mekong Subregion scheme. The export quota system and joint venture investment instituted by the government, and the presence of cheap labor in Mae Sot, lured investors from Hong Kong and Taiwan via the Chinese business networks. In 2002 a cabinet resolution under the Thaksin administration declared Mae Sot a Special Border Economic Zone, encouraging investment, industry, and trade and calling for an expansion of infrastructure, tax and custom privileges, and relaxing of labor restrictions. Together with the border trade and the influx of cheap labor, further investment was lured to the area. However, the resolution did not involve structural change. Then, in 2005, a bill was passed in which Mae Sot was designed to be a combination of industrial estates and governmental agencies, where the private sector was the investor while the government supported the fundamental infrastructure. In 2011 the Thai cabinet approved a budget for hiring a team of expert planners to design the zone, and a government subcommittee focusing on legal preparations finalized a draft royal decree to create a special entity to run the zone. The zone would cover three districts along the border: Mae Sot, the main area for border trade, investment, industry, and tourism; and Phop Phra and Mae Ramat, with their focus on agriculture and agro-industry. On the outskirts of Phop Phra and Mae Ramat Districts are plantations for export crops. Employers are mostly local, and here the pattern of seasonal plantation discourages the labor registration process. In the border area on the route from Mae Sot to Phop Phra, several migrant communities have been established, the majority being agricultural workers. In larger communities there is a temple with resident monks from Myanmar, a small health center, a small cinema or a common area to watch TV, and a grocery store that keeps regular hours. In Mae Sot, there are also different ethnic groups of workers from Myanmar spread out in communities in different subdistricts. The residential arrangement varies from huts built on rented land to rented rooms. Riverine cities such as Muang Mae Klong (Samut Songkhram) along the Chao Phraya have constituted important nodes since pre-Ayutthaya kingdoms. A large population, especially Mon, migrated to the area through the Three Pagodas Pass during the war between Ayutthaya and Burma, forming new communities along the river. In the lower Mae Klong, including Samut Songkhram, the communities experienced rapid growth from the reign of Rama I to Rama IV. Fruit orchards were planted, and the Mon population constructed temples as community centers. During the same time, the Chinese population started to converge around the Mae Klong River area. In Samut Songkhram canals were dug to create channels for improved movement of goods and trade, further drawing the Chinese population. In the late nineteenth century the Chinese population began to expand, leading to changes in the socioeconomic conditions of the lower Mae Klong and the development of the industrial and agricultural sectors in the area. By far the largest population of Myanmar workers in Samut Songkhram is engaged in the fishing industry. In 1947 the Thai government stepped in to develop an operational structure for the fishing industry, introducing several programs to develop the infrastructure so that the industry, which began as family businesses, became more commercialized after the end of World War II and expanded rapidly between 1960 and 1972. Large investments began to pour in. Bigger ships with larger cold storage facilities were employed, enabling travel over longer distances. The industry expanded, and export to neighboring countries soon began. Fish was sold in various forms, which helped the industry grow until 1973, when it began experiencing limitations through trade negotiations with other countries. In addition to growing adversity from the foreign market, the industry was also ­facing a labor crunch and therefore needed to introduce workers from the northeast of Thailand. This population soon took control of the profession. In the 1990s, however, Thai laborers from this area began to disappear. There were too many risks to contend with, such as being taken prisoner while fishing in international waters, or storms. This led to the hiring of foreign workers. Initially the fishing business in Samut Songkhram relied on the fish market in the neighboring province (Mahachai, Samut Sakhon), but when this market became overcrowded Samut Songkhram opened its own fish market in 1989. As the market expanded in Samut Songkhram, so did the demand for labor. In the capital city center of Samut Songkhram, there is a large community of migrant workers behind the fish market. Other communities are spread out in the city and beyond. The workers live mostly in rented row houses, some of which have a common room for recreational activities where workers from the neighborhood can converge. There are shops among the rented rooms that carry products brought from Myanmar. There is a temple called “Wat Mon” by Thais, as well as other Thai temples where workers from Myanmar, especially Mon—who are numerous in the region—attend activities such as religious ceremonies, funerals, or Thai language study. In both Mae Sot and Samut Songkhram, there is a sense of community for migrant workers that extends beyond the kinship network. These communities are a source of support in times of emergency, and a locus for cultural activities where the workers share their customs. There are usually unofficial community leaders who are recognized by the authorities and are trusted by the residents to protect the communities. These leaders also help organize cultural and recreational activities, which sometimes involve transborder cooperation. Occasionally workers seek help from nongovernmental organizations (NGOs) that pay regular visits to the community and provide various services, such as distributing medication and contraceptives, and disseminating information and knowledge about workers’ rights. Among the migrant workers interviewed in Mae Sot/Phop Phra (Tak), all but one person had come either accompanied by or seeking the assistance of friends and relatives who were already in Thailand. They had either “crossed the river by ferry and walked through the forests” or “crossed the bridge,” some fleeing from dire circumstances. Those who had walked through the forests arrived in rural villages and started agricultural daily wage labor. Migrants started as illegal immigrants and lived with the insecurity of being arrested by the police and being deported. As such, they were prepared to take any job available. By contrast, among the migrants in Samut Songkhram, at least 8 of the 17 interviewees explicitly mentioned that they had arrived with the help of an agent. In cases where the migrant moved directly from the border point to Samut Songkhram or to Bangkok, it was invariably through an agent. The agent’s fee ranged from 2,500 baht for earlier arrivals to 5,000 baht 10 years ago; it has since soared to as high as 15,000 baht. In most cases, including those who used agents, the new arrivals had siblings or close relatives already working in the area. Some had initially worked in other areas closer to the border, such as Kanchanaburi or Rajburi, but eventually found their way to their current location where wages were higher and there were more job opportunities, seeking assistance from a sibling or close friend. In addition, in comparison with the migrants in Mae Sot, most migrants in Samut Songkhram appeared to come from a more secure background as land-owning farmers. There is thus a significant difference in the way that migrants arrive at these two locales. In Mae Sot, they arrive without the assistance of agents. Upon arrival, they have little choice but to seek employment in the border areas where they can get by using Burmese or Karen languages. In Samut Songkhram, migrants are ambitious enough to seek jobs with higher wages, and they have the means and financial resources to use agents. At the very start, therefore, a difference exists between those who have the means and channels to go to the interiors, such as Samut Songkhram, through an agent; and those who seek any improvement to their impoverished condition, arriving through their scant means at the border. In either case, however, they need to conceal themselves as illegal immigrants without work permits. Migrants walk through the forests at great risk with or without agents. Some catch malaria and die on the way, while others are caught and deported unless someone bails them out. Wages and working conditions vary greatly between regions and tend to be higher in the interior especially around Bangkok (Table 2). 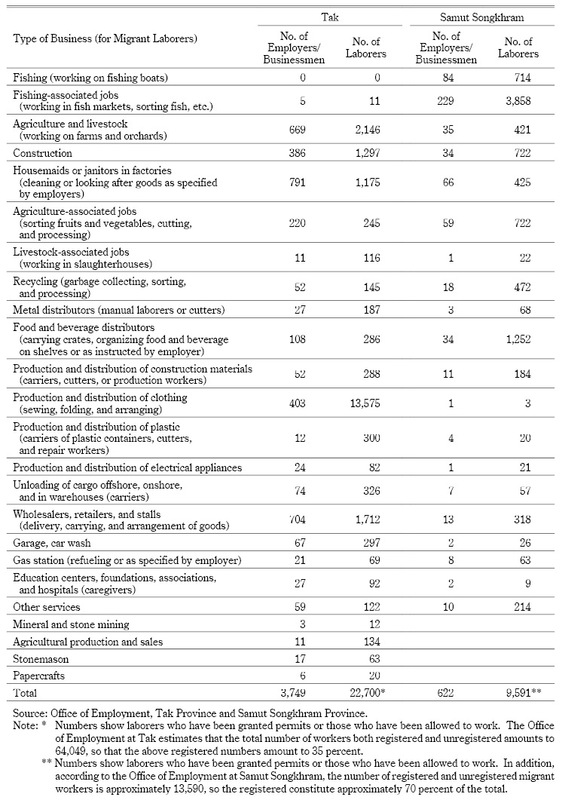 However, even though some border locations, such as Ranong, have a higher wage structure than Samut Songkhram, the latter offers workers the opportunity to hold two or more jobs simultaneously, such as marine processing or market aid in the morning and construction work during the day, so the actual wages can be correspondingly much higher (Table 3). In Mae Sot, as explained above, wages paid to migrant workers are kept far beneath the provincial wage level. Among the 18 interviewees in Mae Sot/Phop Phra, 5 had jobs in factories and the others worked on farms or at irregular jobs. The wages started at 40 baht per day, an incredibly low figure.15) The number of workers with one-year work permits was less than half of the total number of interviewees, and even then, in many cases the permits were retained by their employers, adding to their sense of insecurity. This is corroborated by the Tak employment office figures showing that only 35 percent of migrant workers were registered (Fig. 2); in contrast, in Samut Songkhram 70 percent of migrant workers were registered. Interviewed workers in Mae Sot did not describe the relationship with their employers as one they could rely upon but said that, instead, they sought assistance mainly from NGOs operating in the area. As a rule, when they needed assistance they turned to the unofficial community leader, friends, acquaintances, or NGO staff who extended information on workers’ rights and helped them claim these rights from their employers. Source: Office of Employment, Tak Province. Source: Office of Employment, Samut Songkhram Province. Migrant workers continue to be vulnerable, for the police have free reign to arrest any worker on the street, lock them up, and wait for the employer to bail them out. As such, it is incumbent on employers to maintain a good relationship with the police. In the border region, complicit agreements between the authorities and businesses keep wages at a low level (Arnold 2007). There is a tacit understanding between the nexus of the chamber of commerce, the labor office, and factory employers—and stories abound of employers who delay or refuse wage payment or take possession of workers’ permits. Under circumstances such as these, it is difficult for a worker to raise their voice against the establishment, as is obvious in the case of M below. Even under such harsh conditions, many workers interviewed professed that life in Thailand was much better than in Myanmar. The reasons why they did not move on to areas such as Bangkok and farther south, where they knew that wages and conditions were much better, included the following: (1) some of them had no relatives or acquaintances and could not afford to hire agents; (2) they were afraid of being detained and sent back since they would have to bail themselves out, something many could not afford; and (3) their children could receive an education on the border (more on this below). With respect to the second reason, at least four of the interviewees in Mae Sot admitted that they had been detained and taken to Myawaddy and had to be bailed out (Fig. 3). Source: (a) Mae Sot District Council, Tak Province; (b) Muang District Council, Samut Songkhram Province. The prevalent practice among those interviewed in Mae Sot was that the husband would work with a permit, while the wife would stay at home with young school-age children without obtaining a work permit. This was different from the Samut Songkhram cases, where husband and wife worked together, both obtaining permits, and where in many cases young children were sent back to Myanmar for the grandparents to look after. The motivation to earn and save is evident in the case of migrants in Samut Songkhram, whereas in the border a majority of migrants lead a hand-to-mouth existence yet choose to stay because even under such harsh conditions, they believe that life is better there than in Myanmar. While working conditions in Samut Songkhram are far from easy, wages are comparable with the local standard, and all of the interviewed workers had work permits that they extended every year (Fig. 2). They tended to remain loyal to their jobs, although most workers who were employed in the market did multiple jobs each day. 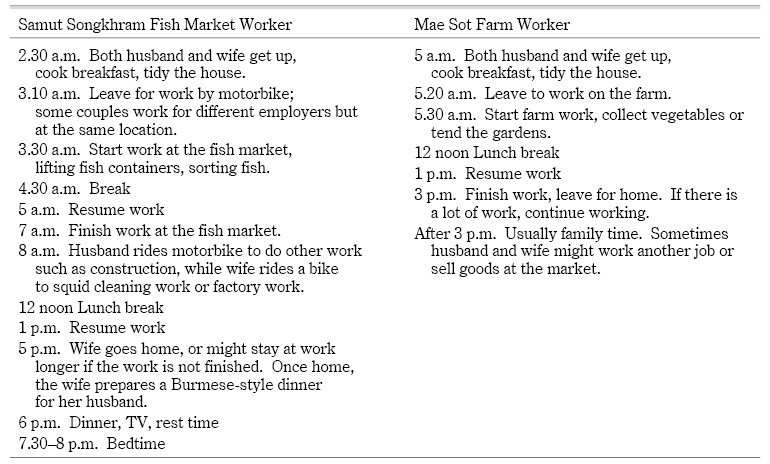 Many couples did a double routine of working in the fish market early in the morning (starting around 3 a.m. and continuing to 7 a.m.) and then doing other jobs (Table 3). Men did construction work, while women took buckets of squid home to process (Table 4). Each person earned around 170 baht per day, which added up to more than 300 baht for a couple. Room rent was between 1,200 and 1,800 baht per month. K’s husband’s case (S-5) is exceptional as he is the captain and mechanic of a fishing boat, which is considered skilled work. However, even in the case of unskilled workers, employer-employee relationships, as depicted by interviewees in Samut Songkhram, tend to be positive. Many interviewees refer to the assistance they receive from their employers in a variety of situations such as marriage, sending their children to school, recommending hospitals, helping pay hospital fees, and recommending medications. The employers also assist in extending their work permits and sometimes agree to pay the registration fees for them in advance. In some cases where workers get arrested by the police, their employers help in negotiating their release. NGO officers in Samut Songkhram disclosed that they advised migrants mainly on health and hygiene issues, rather than issues of workers’ rights or quarrels with employers. As stated above, migrant workers can now apply for nationality verification toward obtaining temporary passports, which will grant them fully legal status. Workers in Samut Songkhram have started to apply for nationality verification and passports through this system. For workers, the most significant advantage of obtaining a passport is that it will allow them freedom of movement back and forth between Myanmar and Thailand, as well as within Thailand. Without a passport, the risk and expense for each trip is very high, forcing workers to limit visits home to once every few years at most. If they have to travel through another province in order to reach the border, the risk multiplies. Leaving the country is relatively easy, but reentering is very difficult. The border point is increasingly difficult to pass, requiring high sums to be paid to agents. Once workers prove their nationality and hold passports, they can travel freely. In addition, if workers have a passport and work permit, their family members or companions have the right to apply for a visiting visa. In stark contrast, none of the workers interviewed on the border in Mae Sot/Phop Phra were undergoing the nationality verification process. Interviews in Mae Sot revealed that migrants were not well informed about it. Moreover, there was less need felt for it as those on the border did not need to travel through other provinces to reach their homes in Myanmar. According to information from the Employment Office in Samut Songkhram, as of August 2011 there were a total of 3,613 migrants (37 percent of all registered workers) whose nationality verification had already been processed. In Tak Province there were a total of 3,853 (16 percent of all registered workers: note that the rate of registered workers with permits was much lower in relation to the total number of workers), which reflects the general trend of drastically lower rates of registration. It is apparent from the interviews that the difference in the condition of workers between the border areas and the inner regions is not only in wages but, more importantly, in migrant status, stability and relationship with employers, access to information, and motivation in the work situation. Working conditions and relationships with employers thus differ markedly between the two locations. In Mae Sot, the structure of relationships among the authorities, businesses, and workers is exploitative. The benefits of registration are low in such a setting. Choices regarding family formation, distribution, and mobility are affected by the conditions surrounding the workplace, as well as migrant status, and differ significantly between Mae Sot and the interior. Some of the migrants marry and start their families before migrating to Thailand, in which case the choice is whether and when to bring other family members. For those who marry in Thailand or migrate as couples, the choice is where to have children and where to bring them up. This affects their remittance patterns and their connection with their homeland. Migrant workers began to flood into Samut Songkhram in the 1990s, mostly new arrivals who were young couples or unmarried youth who married and started families after their arrival. Of the 17 couples interviewed, 10 had met and married in Samut Songkhram, while 7 had been married before.18) This being the scenario, most of the couples began to have children after arriving in Samut Songkhram. In Mae Sot, on the other hand, 13 interviewees already had a family before coming to Thailand. In Mae Sot and Phop Phra, even in cases where the young mother returns home to Myanmar to give birth, in most cases she returns with her children rather than leave them in Myanmar with their grandparents. In the 18 interviews at Mae Sot and Phop Phra, there were only three cases where children were left in Myanmar for their education. Migrants at the border, who lead a hand-to-mouth existence, cannot afford to send regular remittances to their parents to look after their children. In four districts adjacent to the border in Tak, there are about 11,000 Burmese children annually enrolled in the 134 schools under the Thai educational system (from kindergarten to 12th grade). However, education for children of migrant illegal workers is available on the border in the form of “learning centers” (LCs). These are private schools for migrant children outside the Thai educational system. They provide education for migrants’ children close to their own community (Premjai 2011). Classes are taught in Burmese, Karen, or other ethnic languages. There are also Thai teachers who help students learn the Thai language. In 1999, 60 LCs formed an organization called the Burmese Migrant Workers Education Committee. These schools differ in size and in the age of students, but they all have 80 to 150 students, from kindergarten to fifth grade. Since these are unofficial teaching centers, they operate like NGOs and are funded and supported by international organizations. Tuition is free, and technical work support is also provided. Children who go to LCs rarely have the opportunity to go on to higher education, since LCs function outside the formal curriculum. A small number of higher education institutions, usually funded by NGOs, offer further education; all of them are in Mae Sot, including in the refugee camps. A marked contrast can be found in the manner in which migrants in Samut ­Songkhram educate their children. Most children are sent back to Myanmar, which is costly in terms of remittance. A few send them to the local Thai public school, seeking admission with the help of their employers.20) In 10 cases of those who gave birth to children in Samut Songkhram, the choice was to give birth in Thailand and then, when the child was around five years old, send the child back to Myanmar to study. In one case, the woman returned to Myanmar to have the baby, left the child in her mother’s care, and returned to work in Thailand. In cases where the child remains in Myanmar, it is usually the grandparents who look after the child with the help of other relatives nearby. Remittances are sent for the child’s school fees as well as living expenses. In one case, a child who had finished schooling in Myanmar joined her parents in Thailand. Her birth certificate from Thailand enabled her to obtain a Thai identification card. Families make decisions as they gain knowledge and experience in ways of coping, and as their children grow up. Among the interviewees in Samut Songkhram, in only three cases had the children studied in a Thai public primary school. Gaining admission in Thai schools has thus far not been a common choice, for several reasons. First, it has not been easy for migrants to enter a Thai school. Strong support from an employer has made it possible for some. The documentation work has, however, become much easier, and more parents may make this choice in the future.21) Second, it is easier for parents to work from before dawn to late in the evening if they do not have young children living with them. Third, many parents confess that they prefer for their children to study in Burmese schools and receive an education in Myanmar. Once they finish school, in most cases children join their parents in Thailand. Due to the dire economic situation of most workers in Mae Sot and Phop Phra, sending remittances regularly to Myanmar is difficult or impossible. Of the 18 interviewees, 5 explicitly said that they had no money to send back (2 of them said they sent remittances until they had their own children). Only two replied that they sent remittances every year. In both cases, some of the children are grown and now working. Remittances from Samut Songkhram are more regular and systematized, as workers in Samut Songkhram are financially better off. Samut Songkhram parents with children in Myanmar send remittances to cover the expenses of their upkeep. In 8 of the 17 families surveyed, the children stayed in Myanmar and remittances were sent mainly to cover their expenses. Remittances were sent for other purposes as well. In two cases, the couples were building their own house with their remittance. In four cases, the couples were young and without children, or they had children in Thailand but sent remittances to their parents. It is more difficult for factory or farm workers in Mae Sot and Phop Phra to send remittances regularly; and when they do, it is through less systematized channels, such as asking a village acquaintance to carry the money home, or waiting for a family member to come and collect it. When a co-villager is requested to carry money home, a fee of 200 kyat per 10,000 kyat is paid. Others claim that they carry some money home every few years. In some cases, those in Mae Sot are at the receiving end of remittances sent from Bangkok. In one case, a couple in Mae Sot/Phop Phra received monthly remittances of around 1,200 to 3,000 baht from their daughters in Bangkok. They themselves sent remittances home to Myanmar irregularly. It has been demonstrated that from the outset, the choice between moving from their homeland in Myanmar to the Mae Sot/Phop Phra border region on the one hand, and moving directly to the interior on the other, involves a different set of preparations and mediations, and results in vastly disparate work conditions as well as choices for the family. The kind of adaptation required in each locale differs. However, the border can become a stepping stone in the march to the interior—if not taken by the original migrant, then by the next generation or other relatives. Workers in Mae Sot/Phop Phra recognize that wages are higher in the interior. However, their physical mobility depends greatly on the condition of the family. Older parents may have children who work in the interior and may receive remittances, while they stay on the border, continuing daily wage labor, often without work permits. Their children become their new resource by moving to Bangkok. In two cases that we encountered, children sent remittances to parents on the border. We also encountered cases where migrants on the border looked after the children of siblings who worked farther in the interior, and who sent back remittances to the border for the upkeep of their children. In Mae Sot, workers are not dependent on their parents or their family in Myanmar for raising their children, and they are not able to send remittances very often. Conversely, in Samut Songkhram, migrant workers draw upon the help of their relatives in Myanmar for support in bringing up their children. Remittances are sent regularly, and cultural and social ties are maintained. In a sense, for those in Samut Songkhram, ties with the homeland are based on mutual dependence of child care and remittance, whereas for migrants in Mae Sot they are based on sociocultural proximity and physical contiguity. In either case, networks of family relationships are formed on both sides of the border. For the former set of migrants, networks and ties of mutual dependence extend widely between various parts of Thailand and especially the homeland, and are actively maintained. For the latter on the border, mobile offspring or siblings may move to the interior and send remittances back to the border, while ties with the homeland tend to become secondary in spite of their physical proximity to it. Even as workers maintain ties with their homeland and seek refuge in a community in which they can continue cultural and religious practices in their own style, it is crucial for them to acquire the ability to communicate and adapt to Thai culture and society to a certain extent in order to be able to negotiate with employers, police, or administrators and to improve their own conditions overall. Linguistic ability is one clear measure of the readiness to adapt, but not to assimilate, to the Thai context. In Samut Songkhram, the workers interviewed were making the effort to learn Thai. First-generation migrants who have been in the country for more than five years, both male and female, are able to speak Thai to some degree. Here, life would be difficult without adapting to the Thai context, because the migrants are enveloped in a Thai world. Within their community they maintain their customs and language, but they adapt to the Thai setting outside the community, where they refrain from chewing betel or wearing their Burmese sarongs. There is also a school for children to learn Thai that is run by NGOs, as well as one for adults at the education center where lessons are given twice a week for 400 baht a month. Workers in Samut Songkhram are eager to improve their skills at work, as well as their linguistic skills and relationship with their employers, because it means gaining their trust and obtaining better wages and improved work conditions. Employers and employees enjoy the benefits of mutually stable relationships. Yet, despite these relationships and efforts to adapt, 6 of the 17 respondents in Samut Songkhram clearly said that they wanted to return to Myanmar once they had saved enough money. The rest were ambiguous in this regard, especially those few who had children studying in Thai schools. In Samut Songkhram, the outlook toward the future is split, and the decision seems to depend mostly on the choice of the children. In the case of S-10 above, for example, the family will stay on with the children’s generation who are fully adapted to Thailand, whereas in other cases (such as S-14) remittances to Myanmar are made to ensure a better future back home, and the children are educated in Myanmar for their future in the homeland. In Mae Sot, the number of Thai speakers among migrant workers is low, especially among women. In 12 of the 18 cases, the respondent said that she/he could not speak Thai. The need to speak the language and to better adapt to the social and cultural context of Thailand seems to be much weaker on the border, which is characterized by a multiethnic and multilingual population. Where the context itself is one of a multicultural frontier, it is easy to get by with Burmese or Karen anywhere in the town, and many of the workers live in communities of migrants. Curiously, however, physical proximity to the homeland does not seem to be a measure of the strength of migrants’ ties to it. It may seem rather contradictory that many of those on the border who are uninterested in learning Thai also state that they will never go back to their homeland again. Fifteen of the 18 respondents said that they would probably never go back to live in Myanmar. The nuance, in most cases, is less a matter of hope and choice than destiny—they have no place to go back to. One respond­ent explicitly declared that she would not go back to Myanmar because all of their children had now come to Thailand, even though their status was illegal, and there were no close family members left in their home country. This may be due to the refuge situation as well as sociocultural constitution of the border region itself. It is indeed a frontier for those coming from Myanmar, many under dire circumstances. There is less a sense of crossing the border for better wages and a better future, and more a sense of coming to the frontier in a continuous sociocultural space, where life is far more tolerable than the social, economic, and political conditions at home. Migrant workers from Myanmar to Thailand come from varied socioeconomic and geographical backgrounds. The migration is instigated by hopes for refuge from the dire conditions of living in their home country, and/or by an aspiration for better earnings and a better life.23) Because of this, they endure the hardships of migrant status, even if it means taking up demanding jobs and not being selective about their working and living conditions. Migrants in most cases are supported by networks of family and kin in Thailand and across the border. One person’s move brings opportunity for others who follow, expanding networks, decreasing risk, and providing support and opportunity. This fosters the development of a spatial network that expands both across the border and between different localities, constantly redefining their space. The two locations studied here differ markedly in working and living conditions, cultural adaptation, and modes of connecting with the homeland. 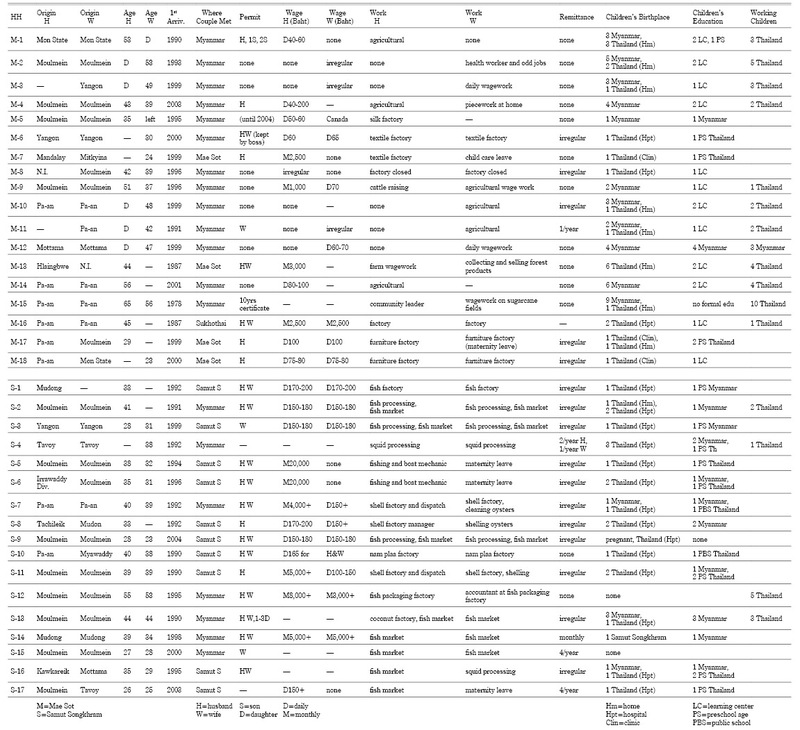 The major points of comparison are indicated in Table 5 (see also Fig. 4). The larger structure of exploitation by “border partial citizenship” and the overall condition of migrants being marginalized workers is the same in both locales, despite local differences in the structure of exploitation. This is the invisible border (Pitch 2007) that they must live with, whether close to or distant from the physical border. However, we have found that the actual implementation of state regulations and the experience and modes of adaptation by migrants differ markedly in the two locales. From the migrants’ point of view, Thailand is not a uniform space. The ways in which migrants form networks and define their respective spaces differ, and across these varied spaces further networks are formed, thus constituting multilayered spaces. In Mae Sot, on the border, migrant space is defined, on the one hand, by the nexus between state and local agents/authorities as well as business owners/employers, which maintain the exploitative structure; and, on the other, by migrants who construct their space in response, based on pre-border as well as newly formed post-border networks and institutions such as the organization of learning centers, local migrant communities with their leaders, migrant workers’ organizations (Zaw Aung 2010), and religious networks. Many migrants in Mae Sot migrated due to dire conditions on the other side, but make use of the cultural continuity across the physical border, expanding their frontiers by use of the “border social system” in that locale. We have found that the decision to migrate at the outset is spatially two-tiered: mobility to the border or to the interior. Furthermore, migrants in the first category or their family members may later seek jobs for better wages in the interior and thereby expand their networks. As a result, we find multilayered spaces that connect locales in Myanmar, the border, and the Thai interior (Fig. 4). Of course, one must not easily label Mae Sot as a border community and Samut Songkhram as interior. Each location has its historical, cultural, economic, and industrial constitution that articulates with the migrant processes to form its own distinctive space. The exploitative structure and the constant influx of migrants that mark Mae Sot as a border is not representative of, nor applicable to, other border locations, as Pitch demonstrates in his comparison between Mae Sot and Mae Sai (2007). We have demonstrated how migrant networks extend within and across the border and how relationships in the networks vary, for example, in the nature of interdependence. This has led to clarifying the manner in which migrants create layers of space by weaving relationships across given political-economic and social contexts. By forming networks in and across these locales, migrant workers better adapt and make use of the migrant labor opportunities despite severe difficulties. Foregrounding the network has allowed us to highlight sociocultural relations in and across the border region as well as the different spaces found in locales within the same state territory, thereby de-­privileging state-defined borders and spaces as the sole definitive factor. This paper has employed the integrative approaches of the meso, micro and macro, ultimately focusing on the networks. This in itself is not new in migration studies (Faist 2000; Brettell 2003). Here, however, we reconsider this in the context of mainland Southeast Asia, where transnational migration takes place in contiguous spaces, crossing physical borders. This has allowed us to see that even space within a nationally defined border is not uniform in the perspective of migrants, who formulate multilayered networks and spaces, thereby forming their space at the border as well as within and across the border. Such an alternative space does not replace the state-defined space; however, it demonstrates that migrant spaces are formed and expanded in the process of their dealing with that monolithic state-defined space, which ultimately dynamically articulates with policies and regulations by the state and locale. By illuminating the spaces formed by networks of migrants from Myanmar to Thailand, this paper has demonstrated that the dynamics of meso-level networks cannot be separated from the functioning and institutionalization of the macro-level on the one hand, and the micro-level decisions by migrants on the other, and that the networks in effect articulate with the geopolitical and socioeconomic setting to form multiple spaces for migrants in and across specific locales. Aree Jampaklay; and Sirinan Kittisuksathit. 2009. Migrant Workers’ Remittances: Cambodia, Lao PDR and Myanmar. ILO/Japan Project on Managing Cross-border Movement of Labour in Southeast Asia. Bangkok: ILO Regional Office for Asia and the Pacific. Arnold, Dennis. 2007. Capital Expansion and Migrant Workers: Flexible Labor in the Thai-Burma ­Border Economy. Human Rights in Asia Series. Nakhon Pathom: Office of Human Rights Studies and Social Development, Mahidol University. Arnold, Dennis; and Hewison, Kevin. 2005. Exploitation in Global Supply Chains: Burmese Migrant Workers in Mae Sot, Thailand. Journal of Contemporary Asia 35(3): 319–340. Brettell, Caroline. 2003. Anthropology and Migration: Essays on Transnationalism, Ethnicity, and Identity. Walnut Creek, CA: Altamira Press. Brettell, Caroline; and Hollifield, James F.  2007. Migration Theory: Talking across Disciplines. Second edition. New York: Routledge. Bussayarat Kaanjondit บุษยรัตน์ กาญจนดิษฐ์. 2006 (2549). Withichiwit khong raengngan khaam chaat thiimaa chaak prathet Phamaa nai phuenthi Krungthep: Korani sueksa raengngan khaam chaat nai khrongkaan soon phasaa Thai phasaa Angkrit khong khana kammakaan ronnarong phuea prachaathipatai nai Phamaa วิถีชีวิตของแรงงานข้ามชาติที่มาจากประเทศพม่าในพื้นที่กรุงเทพมหานคร: กรณีศึกษาแรงงานข้ามชาติในโครงการสอนภาษาไทย-ภาษาอังกฤษ ของคณะกรรมการรณรงค์เพื่อประชาธิปไตยในพม่า [Way of life among transnational labor from Myanmar in the Bangkok region: Results of transnational labor research in the project for teaching Thai and English in the committee of the struggle for democracy in Myanmar]. Research report. Bangkok: Cultural Research and Development Sector Institute of Culture Education. Castles, Stephen; and Miller, Mark J. 2009. The Age of Migration: International Population Movements in the Modern World. Fourth edition. Basingstoke: Palgrave Macmillan. Chalermsak Ngaemngarm เฉลิมศักดิ์ แหงมงาม. 1992 (2535). Panha raengngaan tangchaat sueksaa korani Kariang lop nii khao mueang Amphoe Mae Sot Changwat Tak ปัญหาแรงงานต่างชาติ ศึกษากรณีกะเหรี่ยงหลบหนีเข้าเมือง อำเภอแม่สอด จังหวัดตาก [Problems of foreign labor: A case of illegal Karen immigrants in Mae Sot District, Tak]. Thesis, Chiang Mai University. Faist, Thomas. 2000. The Volume and Dynamics of International Migration and Transnational Social Spaces. Oxford: Oxford University Press. Hayami, Yoko. 2011. Pagodas and Prophets: Contesting Sacred Space and Power among Buddhist Karen in Karen State. Journal of Asian Studies 70(4): 1083–1105. Horstmann, Alexander; and Wadley, Reed L. 2008. Centering the Margin: Agency and Narrative in Southeast Asian Borderlands. New York and Oxford: Berghahn Books. Huguet, Jerrold W.; and Sureeporn Punpuing. 2005. Kaan yaai thin khaam chaat nai prathet Thai การย้ายถิ่นข้ามชาติในประเทศไทย [Migration in Thailand]. Bangkok: International Organization for Migration. Iyotani Toshio 伊豫谷登士翁. 2007. Hoho toshiteno Imin: Ido kara Ba o Toraeru 方法としての移民―移動から場をとらえる [Migrants as methodology: Understanding place from mobility]. In Ido kara Basho o Tou 移動から場所を問う [Motion in place/Place in motion], edited by Toshio Iyotani 伊豫谷登士翁, pp. 3–23. Tokyo: Yushindo. Kritaya Archavanitkul; and Kulapa Vajanasara กฤตยา อาชวนิจกุล, และกุลภาวจนสาระ. 2009 (2552). Kan chang raengngan kham chat taam phraratchabanyat kaan thamngaan khong khon tangdao Pho So 2551 kap kaan chattham banchi raichue achiip samrap khontangchaat การจ้างแรงงานข้ามชาติตามพรบ. การทำงานของคนต่างด้าว พ.ศ. 2551 กับการจัดทำบัญชีรายชื่ออาชีพสำหรับคนต่างชาติ [Employment of migrant workers under the Alien Occupation Act 2008 and the list of occupations allowed to foreigners. Bangkok]. Research report. Bangkok: International Organization for Migration IOM. Kritaya Archavanitkul et al. กฤตยา อาชวนิจกุล และคณะ. 1997 (2540). Bot sangkhro sathaanakaan khon khaam chaat lae thaanglueak nayobai kaan namkhao raengngan khaam chaat khong prathet Thai บทสังเคราะห์สถานการณ์คนข้ามชาติและทางเลือกนโยบายการนำเข้าแรงงานข้ามชาติของประเทศไทย [A synthesis on policy options for importation of foreign labor into Thailand]. Nakhon Pathom: Institute for Population and Social Research, Mahidol University. Kudo, Toshihiro. 2007. Border Industry in Myanmar: Turning the Periphery into the Center of Growth. IDE Discussion Paper No. 122. Lee, Sang Kook. 2007. Integrating Others: A Study of a Border Social System in the Thailand-Burma Borderland. Unpublished PhD dissertation, Department of Sociology, National University of Singapore. Maniemai Thongyou. 2012. Constructing Community across Borders: Lao Immigrant Workers in Thailand. European Journal of Social Sciences 30(4): 637–645. Massey, Douglas S.; Arango, Joaquín; Hugo, Graeme; Kouaouci, Ali; Pellegrino, Adela; and Taylor, J. Edward. 1998. Worlds in Motion: Understanding International Migration at the End of the Millennium. Oxford: Oxford University Press. Menjívar, Cecilia. 2000. Fragmented Ties: Salvadoran Immigrant Networks in America. Berkeley: University of California Press. Nobpaon Rabibhadana; and Surichai Wun’gaeo ณพอร รพีพัฒน์, สุริชัย หวันแก้ว. 2006. Kaan sang khwaam pen eun lae krabuan kaan prap tua khaung dek taang chaat thii thuuk tham raai การสร้างความเป็นอื่น และกระบวนการปรับตัว ของเด็กต่างชาติที่ถูกทำร้าย [Constructing otherness and adaptation among abused migrant children]. Social Science Journal, Naresuan University 2(3). Notsu Takashi 野津隆志. 2010. Tai ni okeru Gaikokujin Jido no Gakko Fushugaku no Yoin: Samutto Sakon Ken ni okeru Myamma-kei Jido no Jirei yori タイにおける外国人児童の学校不就学の要因──サムットサーコーン県におけるミャンマー系児童の事例より [Factors of out-of-school migrant children in Thailand: A case study of Myanmar children in Samut Sakhon Province]. ­Tai-Kenkyu [The journal of Thai studies] 10: 1–16. Nwet Kay Khine. 2007. Remittance Flows from Thailand to Mawlamyine, Mon State, Myanmar. MA thesis, Faculty of Political Science, Chulalongkorn University, Bangkok. Parreñas, Rhacel Salazar. 2001. Servants of Globalization: Women, Migration, and Domestic Work. Stanford: Stanford University Press. Phanthip Kanchanachitra Saisoonthorn พันธุ์ทิพย์ กาญจนะจิตรา สายสุนทร. 1997 (2540). Kaan khao maa nai prathet Thai khong khon tangdaao phuea thamngaan: Khoo samruat thaang kotmaai panhaa lae thaang luek nayobai การเข้ามาในประเทศไทยของคนต่างด้าวเพื่อทำงาน: ข้อสำรวจทางกฎหมาย ปัญหา และทางเลือกนโยบาย [Foreign labor migration into Thailand: Legal survey, policy problems, and options]. Nakhon Pathom: Institute for Population and Social Research, Mahidol University. Phassakorn Kosaiyakanont ภาสกร โกไศยกานนท์. 2004 (2547). Raengngan opphayop phaak utsahakam nai boriwen chaidaen Thai-Phamaa: Korani sueksaa raengngaan sanchaat phamaa nai amphoe Mae Sot Changwat Tak แรงงานอพยพภาคอุตสาหกรรมในบริเวณชายแดน ไทย-พม่า: กรณีศึกษาแรงงานสัญชาติพม่าในอำเภอแม่สอดจังหวัดตาก [Industrial immigrant labor in Thai-Burmese border area: A case study of Burmese laborers in Mae Sot District, Tak Province]. MA thesis, Chiang Mai University. Pitch Pongsawat. 2007. Border Partial Citizenship, Border Towns and Thai-Myanmar Cross-Border Development: Case Studies at the Thai Border Towns. Unpublished PhD dissertation, University of California, Berkeley. Premjai Vungsiriphisal. 2011. The Challenge of Education Policy for Migrant Children in Thailand from Security Standpoints. Kyoto Working Papers on Area Studies No. 107 (G-COE Series No. 105). Center for Southeast Asian Studies, Kyoto University. Rajah, Ananda. 1990. Ethnicity, Nationalism, and the Nation-State: The Karen in Burma and Thailand. In Ethnic Groups across National Boundaries in Mainland Southeast Asia, edited by Gehan Wijeyewardene, pp. 102–133. Singapore: ISEAS. Srinakhon Wongjai ศรีนคร วงศ์ใจ. 2000 (2543). Phonkrathop chak raengngaan Phamaa phit kotmaai nai prathet Thai: Sueksaa koranii amphoe Mae Sot Changwat Tak ผลกระทบจากแรงงานพม่าผิดกฎหมายในประเทศไทย: ศึกษากรณีอำเภอแม่สอด จังหวัดตาก [The impact of illegal Myanmar labor in Thailand: A Case study of Mae Sot District, Tak Province]. Bangkok: Graduate School, Ramkhamhaeng University. Suchadaa Thaweesit สุชาดา ทวีสิทธิ์. 2009. Kansueksa khroopkhrua lae kaan taengngaan khaam chaat nai phuenthi chaidaen Thai-Lao Changwat Ubon Ratchathani การศึกษาครอบครัวและการแต่งงานข้ามชาติในพื้นที่ชายแดนไทย–ลาว จังหวัดอุบลราชธานี [Study of transnational family and marriage in the Thai-Lao border region, Ubon-Ratchathani Province]. Research report. Bangkok: Sirinthon Center for Anthropology. Sukhon Khaekprayuun สุคนธ์ แขกประยูร. 2003 (2546). Raengngaan ying chao Phamaa thii thamngaan nai rongngaan utsahakam hong yen changwat Samut Sakhon แรงงานหญิงชาวพม่าที่ทำงานในโรงงานอุตสาหกรรมห้องเย็นจังหวัดสมุทรสาคร [Burmese female labor working in freezer industries in Samut Sakhon Province]. Research report. Bangkok: Thailand Research Fund. Supang Chantavanich สุภางค์ จันทวานิช. 2008. Phonkrathop khong kaan yaai thin khaam chaat to chumchon chaidaen kae chumchon thii mii phuu yaai thin chamnuan maak nai prathet Thai: Kaan saang khwaam klomkluen lae khwaam mankhong nai chumchon Mae Sot ผลกระทบของการย้ายถิ่นข้ามชาติต่อชุมชนชายแดนและชุมชนที่มีผู้ย้ายถิ่นจำนวนมากในประเทศไทย:การสร้างความกลมกลืนและความมั่นคงในชุมชนแม่สอด [Impact of transnational migration on border community in Thailand: The case of harmony and security building in Mae Sot town]. Bangkok: Institute of Asian Studies, Chulalongkorn University. Supang Chantavanich; Premjai Vungsiriphisal; and Samarn Laodumrongchai. 2007. Thailand Policies towards Migrant Workers from Myanmar. Bangkok: Asian Research Center for Chulalongkorn University. Van Schendel, Willem. 2005. Spaces of Engagement: How Borderlands, Illicit Flows, and Territorial States Interlock. In Illicit Flows and Criminal Things: States, Borders, and the Other Side of Globalization, edited by Willem van Schendel and Itty Abraham, pp. 38–69. Bloomington: Indiana University Press. World Vision Foundation of Thailand and Asian Research Center for Migration มูลนิธิศุภนิมิตแห่งประเทศไทยและศูนย์วิจัยการย้ายถิ่นแห่งเอเชีย. 2005. Kaan yaai thin khao maa thamngaan lae kaan tuuk lokluang khong raengngaan taangchaat nai prathet Thai การย้ายถิ่นเข้ามาทำงานและการถูกหลอกลวงของแรงงานต่างชาติในประเทศไทย [Migrant workers into Thailand and human trafficking in Thailand]. Bangkok: Institute of Asian Studies, Chulalongkorn University. Zaw Aung. 2010. Burmese Labor Rights Protection in Mae Sot. Bangkok: Center for Social Development Studies, Chulalongkorn University. Phraratchabanyat kaan thamngaan khong khon tangdao phoso 2551 Ratchakitchanubeksa พระราชบัญญัติการทำงานของคนต่างด้าว พ.ศ. 2551 ราชกิจจานุเบกษา [Alien Occupation Act 2008 in Government Gazette]. Vol. 125, No. 37, p. 24. May 22, 2008. Phraratchabanyat khon khao mueang Ratchakitchanubeksa พระราชบัญญัติคนเข้าเมือง ราชกิจจานุเบกษา [Immigration Act in Government Gazette]. Vol. 116, No. 108, p. 1. November 5, 1999. Vol. 96, No. 28, Special Issue, p. 45. March 1, 1979. Vol. 67, No. 71, p. 1208. December 26, 1950. Phraratchabanyat pongkan lae prappraam kaankhaa manut phoso 2551 Ratchakitchanubeksa พระราชบัญญัติป้องกันและปราบปรามการค้ามนุษย์ พ.ศ. 2551 ราชกิจจานุเบกษา [Human Trafficking Suppression and Prevention Act B.E. 2551 in Government Gazette]. Vol. 125, No. 29, p. 28. February 6, 2010. Phraratchabanyat sanchat chabap thii 4 Ratchakitchanubeksa พระราชบัญญัติสัญชาติ ฉบับที่ 4 ราชกิจจานุเบกษา [Nationality Act in Government Gazette]. Vol. 125, No. 39, p. 24. February 27, 2008. Phraratchabanyat sanchat chabap thii 3 Ratchakitchanubeksa พระราชบัญญัติสัญชาติ ฉบับที่ 3ราชกิจจานุเบกษา [Nationality Act in Government Gazette]. Vol. 109, No. 42, p. 94. April 8, 1992. Phraratchabanyat sanchat chabap thii 2 Ratchakitchanubeksa พระราชบัญญัติสัญชาติ ฉบับที่ 2 ราชกิจจานุเบกษา [Nationality Act in Government Gazette]. Vol. 109, No. 13, p. 3. February 25, 1992. Phraratchakritsadika kamnot ngaan nai achiip lae wichaachiip thii haam khon tangdao tham chabap thii 4 phoso 2548 Ratchakitchanubeksa พระราชกฤษฎีกากำหนดงานในอาชีพและวิชาชีพที่ห้ามคนต่างด้าวทำ (ฉบับที่ 4) พ.ศ. 2548 ราชกิจจานุเบกษา [Royal decree on the types of work to be prohibited for aliens in Government Gazette]. Vol. 122, No. 38, Special Issue, p. 4. May 10, 2005. Phraratchakritsadika kamnot ngaan nai achiip lae wichaachiip thii haam khon tangdao tham chabap thii 2 phoso 2536 Ratchakitchanubeksa พระราชกฤษฎีกากำหนดงานในอาชีพและวิชาชีพที่ห้ามคนต่างด้าวทำ (ฉบับที่ 2) พ.ศ. 2536 ราชกิจจานุเบกษา [Royal decree on the types of work to be prohibited for aliens in Government Gazette]. Vol. 110, No. 189, Special Issue, p. 24. November 17, 1993. Phraratchakritsadika kamnot ngaan nai achiip lae wichaachiip thii haam khon tangdao tham phoso 2522 lae banchii Thai phraratchakritsadika Ratchakitchanubeksa พระราชกฤษฎีกากำหนดงานในอาชีพและวิชาชีพที่ห้ามคนต่างด้าวทำ พ.ศ. 2522 และบัญชีท้ายพระราชกฤษฎีกา ราชกิจจานุเบกษา [Royal decree on the types of work to be prohibited for aliens in Government Gazette]. Vol. 96, No. 80, Special Issue, p. 35. May 14, 1979. Prakaat krasuang mahaatthai rueang kaan anuyaat hai khon tangdao baang champhuak khao maa yuu nai ratcha-anachak pen koranii phiset kho 4, 6 aasai amnaat taam nueakhwaam nai maatraa 17 nai ­phraratchabanyat khon khao mueang phoso 2522 Ratchakitchanubeksa ประกาศกระทรวงมหาดไทย เรื่อง การอนุญาตให้คนต่างด้าวบางจำพวกเข้ามาอยู่ในราชอาณาจักรเป็นกรณีพิเศษ ข้อ 4, 6 อาศัยอำนาจตามเนื้อความในมาตรา 17 ในพระราชบัญญัติคนเข้าเมือง พ.ศ. 2522 ราชกิจจานุเบกษา [Announcement of the Ministry of Interior regarding special cases for admitting some aliens to enter and live in Thai territory, items 4 and 6. According to section 17, Immigration Act 1979 in Government Gazette]. Vol. 125, No. 55, Special Issue, p. 11. March 17, 2008. Vol. 127, No. 69, Special Issue, p. 31. June 17, 2010. Prakat khong khana patiwat chabap thii 322 Ratchakitchanubeksa ประกาศของคณะปฏิวัติ ฉบับที่ 322 ราชกิจจานุเบกษา [Announcement of revolutionary council 322 Royal Thai Government Gazette]. Vol. 89, No. 190, Special Issue, p. 94. December 13, 1972. 1) Many people have fled Myanmar due to violence in their homeland, and it is thus difficult to distinguish clearly between migrant workers and refugees (Faist 2000, 138). The total number of registered migrant workers from Cambodia, Laos, and Myanmar in Thailand in 2009 was 1.3 million, of whom 1.08 million were from Myanmar. The number of unregistered workers is estimated to far exceed this number. 2) A recent exception is the work of Maniemai Thongyou on Laotian migrant workers’ cross-border networks in Thailand (2012). 3) Fieldwork was conducted during the following periods: December 2006; August–September 2008; February–March, August–September, and November 2009; and February–March and August–­September 2010. The research was made possible by the G-COE Program of Kyoto University, In Search of Sustainable Humanosphere in Asia and Africa, Field Research Program for Graduate Students 2010, and the Scientific Research Fund (C) of MEXT (FY2009–11). 4) See Immigration Act 1950 (2493), 1979 (2522), and 1999 (2542). 5) The reason for this was the prevailing general sentiment that the large and increasing number of foreign workers diminished the size of the internal labor market, thus affecting the sustainability of the lifestyle of Thai people. 6) Nationality Act 1992 (2535) and 2008 (2551). 7) See more in the royal decree on the types of work to be prohibited for aliens in 1979 and in Government Gazette 2(4) (1993; 2005). 8) Migrant laborers also began to receive protection through the Thai government’s Protection and Control against Human Trafficking Act (2008) and Human Trafficking Suppression and Prevention Act 2551, which prohibited human trafficking of all kinds (Act of Protection and Control against Human Trafficking 2008 ). 9) The same agreement had been made with Cambodia and Laos in 2006. The Myanmar agreement took much longer. The Myanmar regime instituted three border posts where the verification could be carried out, and the actual process began only in July 2009. 10) In January 2013, this was further extended to April 2013. In February 2013, there were 733,413 Myanmar migrants who had received the verification. 11) Half of the 16 ferry piers at Myawaddy in 2003 came under the control of this faction. 12) Section 13 of Immigration Act 1979. 13) One of the interviewees mentioned the armed conflict in Myanmar as a reason for migration, and another mentioned that his house in Myanmar had been torn down. Many of the migrants came from areas affected by the armed conflict. 14) On the border, there were cases of divorcees as well as people who had lost a spouse. In 3 of the 18 cases, the husbands had died in Mae Sot from a high fever as they were unable to go to the hospital because they lacked permits. The bereft spouses did not return to Myanmar. 15) In the farming communities, the cost of accommodation was 100 baht per head for wood and bamboo huts that the workers built themselves. In town, it ranged from 200 baht for housing, plus 100 baht for gas, up to 500 baht. Accommodation was once free in these communities, but with the ever-increasing number of people the cost of living is rising. 16) A private clinic founded in 1989 by Dr. Cynthia Maung for migrants and refugees. 17) See more in the announcement of the Ministry of Interior regarding special cases for allowing some aliens to enter and live in Thai territory: items 4 and 6, section 17, Immigration Act 1979. 18) Even though they met and married in Thailand, notably, four are from the same general area (Moulmein, for example) and four others are from the eastern part of Myanmar (Karen State, Mon State, or Tannintayi). 19) With this certificate, the children of migrant workers born in Thailand can submit an application for citizenship when they are of legal age, even if the parents were not legally married. This does not mean the automatic conferral of citizenship, as that depends on the state’s deliberation of such factors as the parents’ personal history of cohabitation and past records. With a work permit a worker is able to apply for the 30 baht health card, so a mother with a work permit pays only 30 baht for delivery, while a baby’s health expense is around 900 baht. 20) In 2005 the Thai Ministry of Education laid out a regulation according to which migrant children had the right to receive an education regardless of their parents’ legal status, and public schools would receive a budget from the government to accept such children. However, the actual management of the regulation has been left to local administrations, which has hindered its implementation. In Samut Songkhram, migrant children enrolled in public schools are a very small minority (123 in 2009). Learning centers are limited to those run by NGOs to prepare younger children to enter Thai schools. In neighboring Samut Sakhon Province, which also has a large number of migrant laborers, greater public school enrollment has been observed, due to support by NGOs; yet it has been reported that migrant parents of Mon derivation prefer to send their children to learning centers run by Mon NGOs (Notsu 2010). 21) In Samut Songkhram municipality, there has been a small but definite increase in the number of non-Thai students from the year 2006 onward, most of who are children of Burmese migrant workers. The number of students increases each year. In four schools in the municipality, the number rose from 7 in 2006 to 66 in 2010. 22) There is a “primary collector,” a small-scale trader who may have been a migrant him/herself. He makes money from the exchange rate and the phone call fees. He sends the money he collects to the bank account of a “secondary collector.” The secondary collector is a businessman who has a passport and bank account in Thailand and who travels back and forth across the border often. The secondary collector contacts the distributing agent on the Myanmar side. The distributor receives the notice and contacts the recipient to come and collect the money at a certain time, and to let them know when to wait for a phone call since the recipients in Myanmar usually do not have their own phones. The cost of sending 100,000 kyat home is 50 to 70 baht (in 2009, 100,000 kyat was equivalent to 2,650–2,670 baht). The recipient pays 500 kyat as courier fee to receive 100,000 kyat (Nwet Kay Khine 2007). 23) The fine line that separates the choice to live in or outside the refugee camps needs to be the topic of another investigation. 24) While the newly instituted nationality verification process may enhance this tendency, the future for migrant labor from Myanmar is impossible to foresee. The regime has opened up to both, forces of democratization within the country as well as to foreign involvement, so that labor demand may rise within Myanmar itself.